Addison’s Leatherflower is a threatened species that is native to the Ridge and Valley Province in Virginia. Most of the remaining populations occur here in Montgomery County (Southwest VA). The plant prefers dry, rocky, limestone hillsides, banks and ravines. Addison’s Leatherflower is a perennial vine that starts out as an erect plant but eventually arches over or climbs on another plant. The rounded leaves are opposite, and somewhat variable in size and shape. The pinkish purple/to reddish flower usually arises from the tip of the stem. The flower is firm (like leather!) and shaped like an upside-down urn. These photos were taken in late April and early May at Falls Ridge Preserve in Montgomery County. One or two photos were also taken on private property near Shawsville. 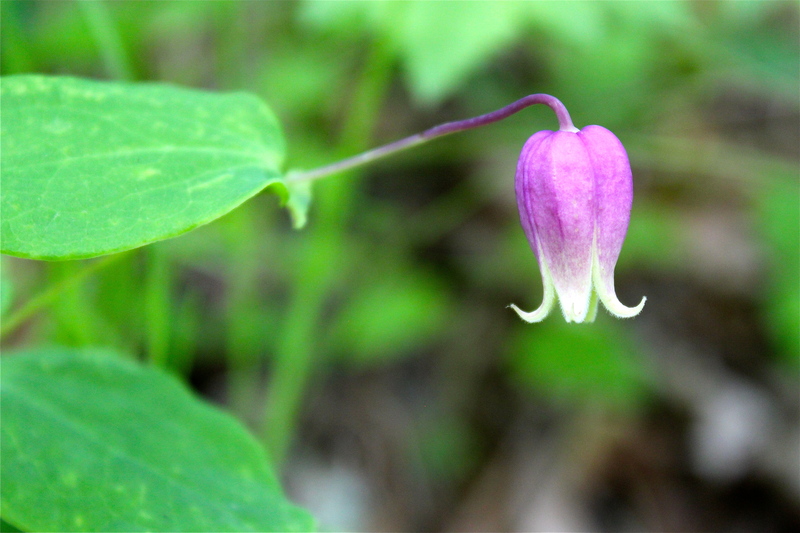 Nearby plants included white trillium, skullcap, wild ginger, hepatica, twinleaf, and golden star. *Illustration credit:USDA-NRCS PLANTS Database / Britton, N.L., and A. Brown. 1913. An illustrated flora of the northern United States, Canada and the British Possessions. 3 vols. Charles Scribner’s Sons, New York. Vol. 2: 123. You got it in bloom! yes, today at Falls Ridge! Hi there! I am a student at the College of William & Mary, and I am in a conservation biology class that is working with the US Fish and Wildlife Service. For our end of the year project, we have been assigned groups and a species found in Virginia that may be in need of listing. My group’s assigned species was Addison’s leather flower. We would love to get in contact with you to ask where you got your information from, and if you have any more! An email or phone number would be great. Thanks so much!